We have seen it countless times—the method by which those with power have maintained and expanded that power to immeasurable proportions. Though we may not be aware of this method, on some level, we know that it exists. In actuality, it is in constant use by elitist interests. What method am I referring to? When a manipulative group intends to achieve an objective on a large scale, and they know the general public will adamantly resist the change, the manipulative party will employ a series of social mechanisms. We may refer to this procedure as Problem-Reaction-Solution—an aspect of what is known as the Hegelian dialect. This method can be easily recognized by its attributes. This method of societal manipulation is typically used by those in power who only desire to seize greater control over the people. Such power-hungry elitists commonly perceive general freedom of the people as a threat to their status. Consequently, they seek to squelch that freedom in any way they see fit. This is the true objective behind the methods of the Hegelian dialect. In order to achieve a pre-planned objective, a number of steps must be implemented. First a problem is introduced or created by elitist manipulators. This perceived problem typically relates to a situation of which the general public is already aware and usually involves that situation apparently escalating out of control. The problem presented can either be a warped representation of an actual problem, or it may be a completely fictitious issue that doesn't exist at all. After this problem has been introduced to the people, a manufactured reaction is orchestrated so that the general public is socially conditioned to imitate the popular response. This conditioning typically comes in the form of news broadcasts and programming, staged public protests, and various displays of apparent public outrage. (We have seen many of these in the past few years, and these have been extremely convincing in the moment.) This reaction can also come from government officials in emotional displays of sympathy, outrage, or a combination of various emotions. Finally, a solution is proposed to the public. This solution is not a solution to any true problem at all, but only appears to be so. It may look authentic and positive in its presentation, but in reality it is severely disadvantageous to the common people. In truth, this solution only consists of the original pre-planned change and actually involves robbing the general public of their freedom. We have seen this method used numerous times over the last century. It was used to initiate WWI, WWII, the implementation of the Federal Reserve (allegedly), the invasion of Panama, the Cold War, Desert Storm and the Iraq war, and the list goes on. Nearly every instance of a land or power grab initiated by the U.S. government/corporation has been somehow justified by some false flag operation designed to cause an uproar among the American population. This uproar is necessary for the manipulators, as the people must demand some drastic change so that the perceived problem can be solved. This way, when the manipulative regime rushes the new policy through, the people have little time to consider the ramifications and object to the new policies. The hard truth is that no matter who we are or how aware we believe ourselves to presently be, we have all fallen for this method numerous times. There was a point in each of our lives that we saw this method used, and have even acquiesced to the fictitious solutions handed to us by a government and corporate media that cared little or nothing about our well-being. Many of us are still falling for this method now, and just like every other time, these people have no clue what the true situation is. So who is the latest boogieman the corporate media is selling to us? What is the visible reaction we are being presented with which we have believed to be true to life? What is the solution being consistently handed to us? These are important questions to answer before we allow ourselves to be led like sheep to the slaughter yet again. This is one explanation of the Hegelian dialect. Here is the website Infowars with a slightly different take on the subject. 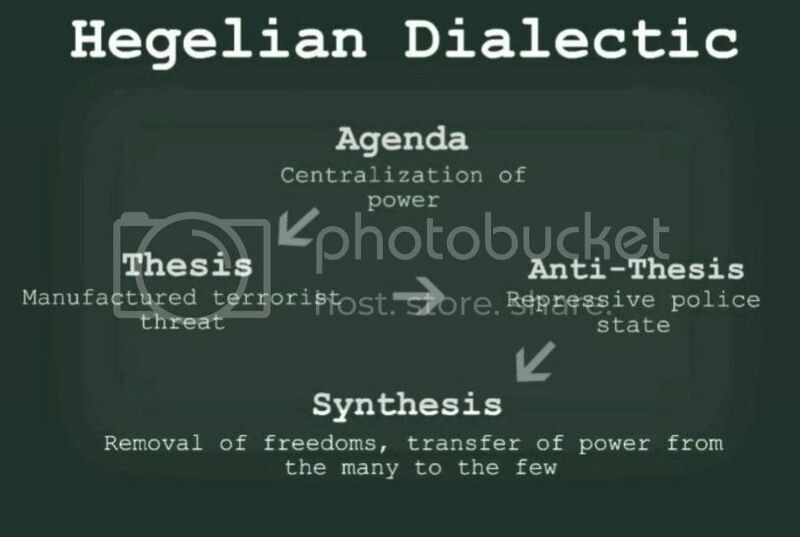 What exactly is the Hegelian Dialectic? Georg Wilhelm Friedrich Hegel was a 19th century German philosopher who devised a particular dialectic, or, method of argument for resolving disagreements. His method of arriving at the truth by the exchange of logical arguments is a system of thought process still use to this day. To put it simply, the basis of Hegelianism dictates that the human mind can’t understand anything unless it can be split into two polar opposites. Good / Evil, Right / Wrong, Left / Right. For example when people are talking about 2 political parties, Labor or Liberal, what they’re actually referring to, without realising it, is the thesisand the antithesis based off the Hegelian Dialectic. The only real debate that occurs is just the minor differences between those two parties. Nothing is said or done about the issues that neither left or right is discussing. This in particular will become more apparent as the election draws near. 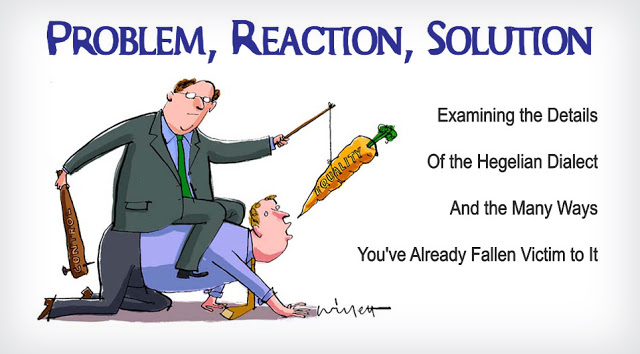 Another form of the Hegelian Dialectic is Problem – Reaction – Solution. Most of us unwittingly fall victim to it all too often and sadly if we don’t stop, we will continue to lose our free will and liberties. It has been widely used by our governments and corporations around the world. You could say that in terms of controlling the masses, and society in general, it’s deployment has been an effective tool in keeping humanity in check. Problem – manufacture a crisis or take advantage of one already in place in order to get the desired Reaction of public outcry whereby the public demands a Solution which as been predetermined from the beginning. A classic example is 9/11. Only when you break the left/right paradigm and come to the realisation that the invasion of Iraq and Afghanistan and the whole fake, and not to mention contradictory, war on terror was the desired outcome for the neo-conservatives within the Bush administration and the whole military industrial complex. They in fact stated in their own white papers the need for another catastrophic and catalysing event like a “new Pearl Harbour”. Billionaire George Soros has Ties to More than 50 ‘Partners’ of the Women’s March on Washington - What is the link between one of Hillary Clinton’s largest donors and the Women’s March? Turns out, it’s quite significant. Here’s a more current example of the Hegelian Dialectic is use. In Australia at present both of the main political parties on the eve of the upcoming election on September 7 are discussing “Boat People”. A derogatory term used to describe refugees and asylum seekers displaced by war or other hardships. I don’t believe they constitute what you would call a “crisis” as the statistics clearly show they aren’t, but for the purpose of this example, our Government is telling us they are a problem. The media is used to play up this problem in order to instigate a reaction (debate) in the public domain on how to tackle it. Both the opposition and ruling party offer their solution. Again we see that the only real debate occurring is just the minor differences between those two parties. Nothing is said or done about the many other more important issues that neither left or right is discussing.